The graceful, majestic bald eagle is the national symbol of the United States. The powerful bird is meant to symbolize liberty, freedom, and independence. Once endangered, the bald eagle has recovered and continues to live across the United States. Let’s explore some interesting facts about the United States’ national bird! What do bald eagles look like? Bald eagles are large, powerful birds with dark brown wings and bodies and white heads and tails. They are not actually bald. In fact, their name comes from the Old English word “balde,” meaning white. Bald eagle’s beaks and legs are bright yellow. They have powerful talons made up of four muscular toes for catching and carrying prey. Male bald eagles are smaller than female bald eagles. Females may weigh 14 pounds and have a wingspan of eight feet. Males can weigh up to 10 pounds and have a wingspan of six feet. Where do bald eagles live? Bald eagles like to live near bodies of water, especially coasts and lakes with many fish. They live in scattered locations throughout the contiguous United States and into Mexico. However, the largest numbers can be found near bodies of water in Canada and Alaska. 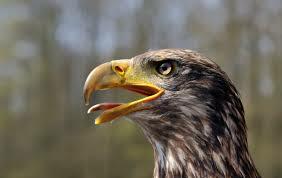 Bald eagles prefer to eat fish, including salmon, herring, catfish, and carp. They will also eat birds like ducks and coots. In addition, bald eagles may eat small mammals such as jackrabbits and muskrats. They have been known to dine on turtles, crabs, and shellfish as well. Bald eagles sometimes eat carrion (dead animals) or garbage, and they steal food that has been killed by other animals. How do bald eagles behave? Bald eagles usually live alone or in pairs instead of gathering in flocks. However, there are sometimes many bald eagles in one place due to a common food source or shelter from the cold. In pairs, the male and female work together to build a nest, usually in the treetops. Bald eagle nests can be huge, weighing about a ton and measuring eight feet long. 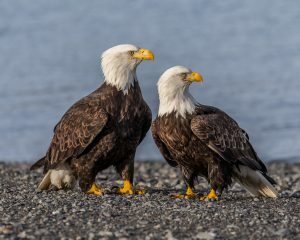 Once they are paired, bald eagles remain bonded for life. Female bald eagles typically lay one pair of eggs a year, though they may lay just one egg or up to three eggs. Both parents incubate the eggs (sit on them until they hatch) for about 35 days. Young bald eagles are dark brown and don’t get their distinctive white markings for several years. They begin flying at about 10-12 weeks old. Until then, the mother and father bring food to the nest and feed the young. Bald eagles make several different sounds. They have a “peal call,” a “chatter call,” and a low “kuk-kuk-kuk” sound. Baby eagles use a distinct chirping sound to beg for food. In 1782, when bald eagles became the national symbol of the United States, there were probably as many as 100,000 nesting eagles. Over the years, the population declined due to many factors. These included a loss of nesting habitat and threats from farmers, who would shoot eagles to keep them away from their chickens and livestock. In 1940, a Bald Eagle Protection Act was passed. Soon, bald eagles faced a new problem: DDT. DDT is a pesticide that would wash into waterways and be absorbed by fish. When bald eagles ate the contaminated fish, they were poisoned. The chemical caused them to produce fragile eggs that often broke or did not hatch. By 1963, there were only 487 nesting eagle pairs living. They were placed on the endangered species list, and DDT was banned from the United States in 1972. Today, bald eagles have recovered and are no longer considered endangered. 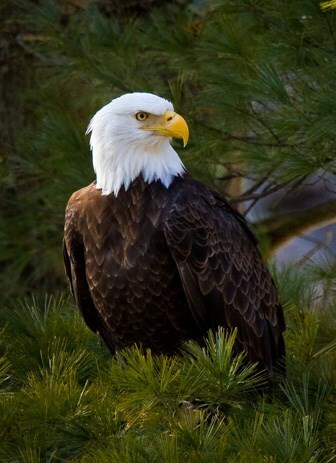 There are an estimated 9,728 nesting pairs of bald eagles in the United States, with more in Canada and Alaska. In the wild, bald eagles may live 15 to 25 years. Not everyone loves bald eagles. Benjamin Franklin was against the bald eagle becoming the national symbol, calling it a “lazy” bird “of bad moral character.” He considered the turkey to be “much more respectable.” But did he want the turkey to become the national symbol? 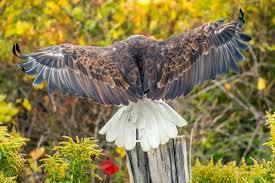 The bald eagle has a wingspan of eight feet. Up to 4,000 bald eagles may gather on a riverbank to catch spawning salmon (when many salmon swim to a safe place to lay their eggs). Bald eagles can dive up to 100 miles per hour to grab a fish from the water. 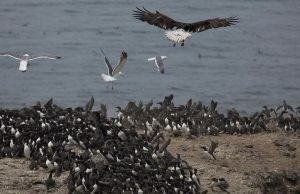 California bald eagles have been spotted as far away as Alaska! Although bald eagles travel great distances, they usually nest and lay their eggs within 100 miles of the place they were born.